An atypical peg-like terminal constriction (“peg”) on metaphase chromosomes of the plant genus Oziroë could be identified as a nucleolus organizing region (NOR) by detecting 45S rDNA with correlative light microscopy (LM) and scanning electron microscopy (SEM) in situ hybridization (ISH). 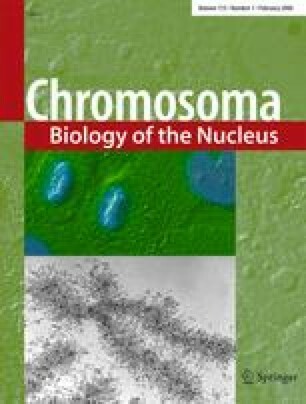 Using high-resolution 3D analytical SEM, the architecture and DNA distribution of the peg-like NOR were characterized as typical for chromosomes, albeit with significantly smaller chromomeres. ISH procedure was improved for SEM concerning signal localization, labeling efficiency, and structural preservation, allowing 3D SEM analysis of the peg-like NOR structure and rDNA distribution for the first time. It could be shown that implementation of FluoroNanogold markers is an attractive tool that allows efficient immunodection in both LM and SEM. A model is proposed for the peg structure and its mode of condensation. The authors thank Katrin Kumke, Sabine Steiner, and Emilie Vosyka for excellent technical assistance, Dr. Helmut Formanek for supplying the Pt blue compound and for support in researching molecular sizes, and Renate Reichinger-Bock for artwork.